That’s right ladies and gentlemen, Co-op will be returning in Call of Duty: Black Ops 3! The tutorial is from the “Cyber Core” play through or “Ramses Station”. This was an exclusive play though at the PlayStation booth at E3. Call of Duty: Black Ops 3 is being described as a dark, gritty future where a new breed of Black Ops soldiers emerge, and the lines are blurred between our own humanity and the cutting edge technology of the military that can make or break the future of combat. Black Ops 3 campaign has been designed for four-player online co-op or traditional solo play where players will encounter epic cinematic moments and open-area game play. This allows the players to approach the game with different strategy each time they play. What’s making this game different from the other Call of Duty games is that you can now completely customize your character, from weapons and load-outs, to abilities and outfits and with a progression system (I think its like the one from Battlefield).With all of this and a ton of exciting new features coming on November 6, Call of Duty aims to deliver an all new constantly evolving campaign experience. So whether they are going to deliver more campaign in DLC drops i don’t know but they are leaving us with so many unanswered questions. “The Giant” which will only be playable if you pre-order Call of Duty: Black Ops 3, is Treyarch’s secret weapon. you get to re-live the chaos of the classic map “Der Ride” from “World At War”. Picking up where Origins left off with Dempsey, Nikolai, Richtofen, and Takeo, join the crew to unravel the mystery of where it all began. From the same team that brought you Call of Duty: World at War – Zombies, they have returned with an all-new, mind blowing tale of the un-dead. Set in the 1940’s, Jeff goldblum, Heather Graham, Neal McDomough and Ron Perlman star in the new “Shadows of Evil”. four unwitting characters are brought together under mysterious circumstances. Unravel the secrets of the un-dead and explore a massive world in the deepest zombie experience to date. The new Call of Duty: Black Ops 3 Multiplayer experience expands the possibilities of previous Call of Duty Multiplayer games. With the new movements system which allows players to chain movements together while in the new maps which have been created from the ground up to make the game play more head-to-head. You can choose to play as one of the new nine Specialists, each of them has their own look, personality, abilities and level progression system (Kind of like Battlefield). On top of this, you will be able to equip up to five attachments and an optic sight while being bale to customise nearly every aspect of your load-out in Gunsmith. Then give your weapon a signature look in the Paint shop. Xbox 360 and PlayStation 3 versions of the game may vary in features to NexGen Consoles. Microsoft are trying to fix the error as I’m typing this. 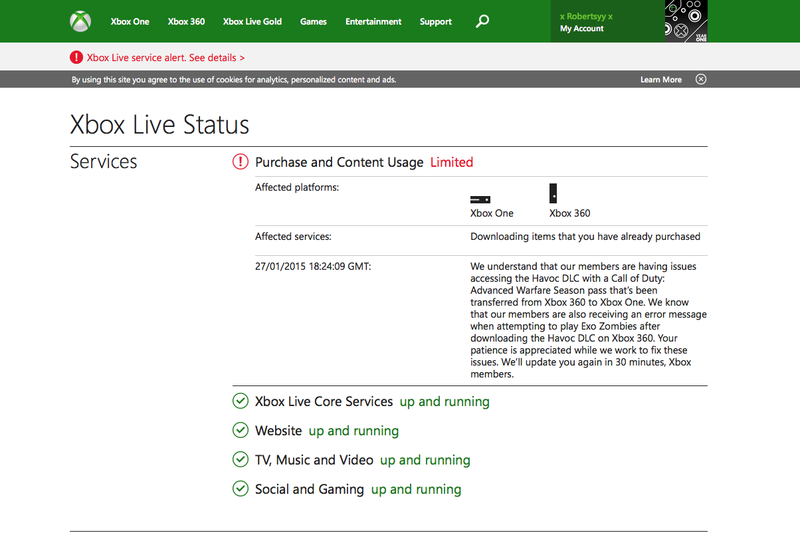 It has something to do with the ‘Season Pass’ moving over to the XboxONE from the Xbox360. 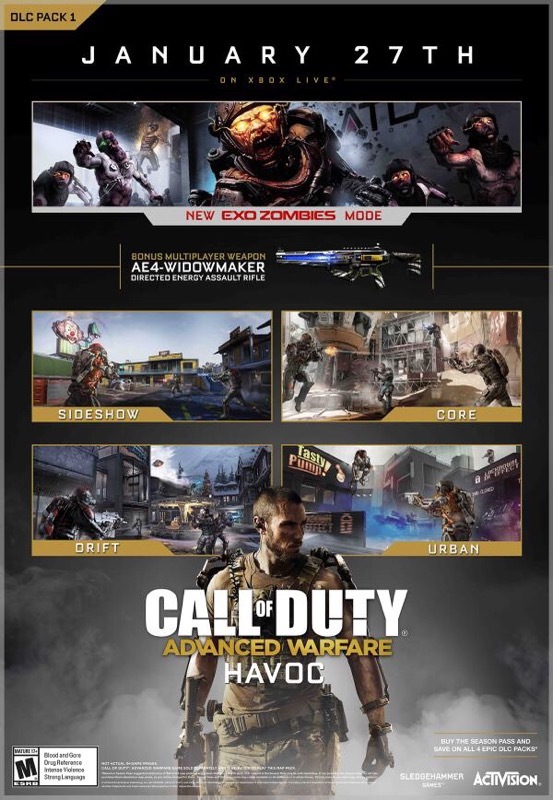 Sledgehammer games have released details on when Advanced Warfare’s first map pack is going to be released and the maps and zombies mode that will be included! So, as you can see above there will be 4 new maps, 2 new weapons and the first episode of the new Exo Zombies mode! The 4 new maps will be Sideshow, Core, Drift and Urban. Now Sledgehammer Games have not released much information regarding the maps yet but keep a look out for the reveal trailer! All of this will be dropping 27th January on Xbox 360 and Xbox One. PS3, PS4 and PC will be the 27th February.